Out of all the zodiacal constellations that exist, Cancer is one of the most inconspicuous. It’s stars are pretty faint, and unless you live in an area where there is very little light pollution, Cancer can definitely be a challenge to find. 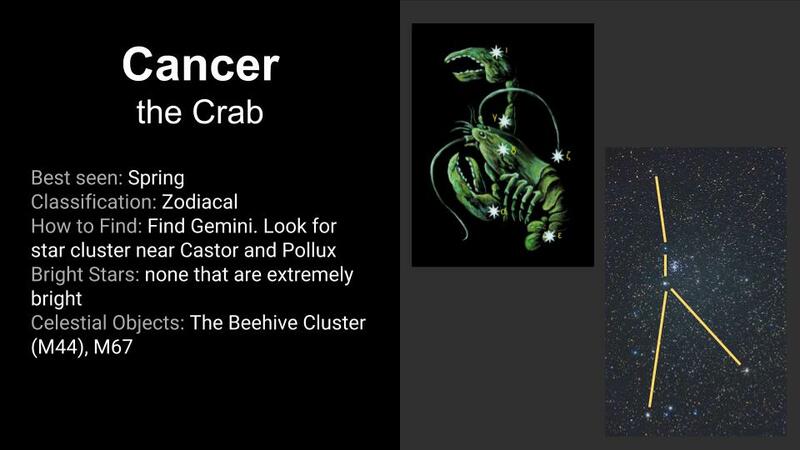 For me, I was able to figure out where this constellation was by finding Gemini and Leo, and using a star chart to realize that Cancer is situated right between these two easily identifiable constellations. 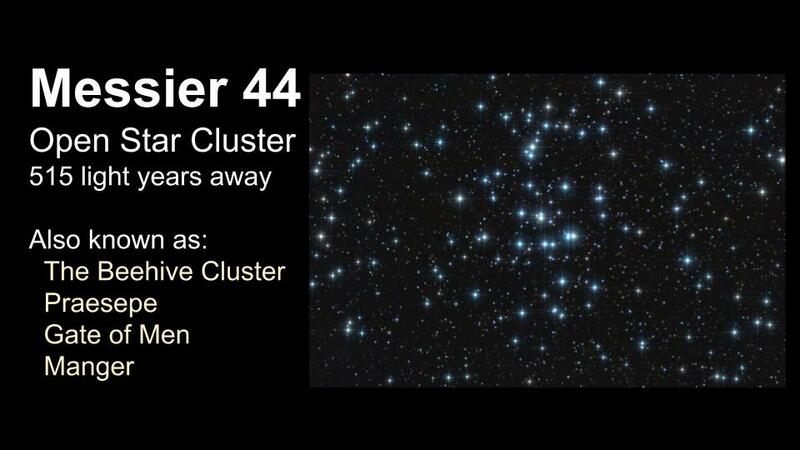 It was also able to discover Cancer by finding the Beehive Cluster, also known as Messier 44. This cluster has a rich history surrounding it. To the unaided eye, the Beehive Cluster looks like a fuzzy patch in the sky. It has been called the Beehive Cluster by early observers because of its resemblance to a swarm of bees, and the name has stuck in modern times. Ancient Greek astronomers called this cluster Praesepe, and they believed they were peering into the floor of heaven called the Gate of Men, where souls descended from heaven to earth to be born. Praesepe played an important role in the history of astronomy. Galileo was the first to turn his telescope to this fuzzy object in the sky, only the discover it was a star cluster. The discovery of this cluster, along with many other observations made by Galileo, became the catalyst to the scientific revolution. The ideas about the universe that were laid out by Aristotle so many years away because to shift and change once Galileo challenged the old beliefs with new observations. Cancer is a fascinating constellation. It has more than one cluster, and if you can find Gemini and Leo, Cancer sits in between these two recognizable constellations.